LOS ANGELES - Recent changes in the energy sector mean there has never been a better time to switch to solar energy, according to renewable energy provider Solar Earth Choice. Sophia Saul of Solar Earth Choice says these changes should convince both homeowners and businesses who have been on the fence about solar. Large utility companies, including Southern California Edison, are now planning to put all households on a time-of-use rate plan by 2020. Under this system, homeowners will pay higher rates for electricity when there is high demand. Weekdays and summer evenings are likely to attract higher rates, causing electricity bills to skyrocket. In Saul's opinion, SoCal Edison has been encouraging homeowners to give serious consideration to installing solar panel systems. Many have said solar energy is the way of the future, but changes in the energy sector may now make it the way of the present. In addition to sending unused energy back to the electric companies for income, it can also be stored in a solar battery. That energy could be used during the more costly time-of-use periods and then recharged when electricity rates are lower. Homeowners also need to consider the 30 percent energy tax credit. The credit will be slowly phased out at the end of 2019. Only those converting to a new renewable energy source, like a solar panel installation, can take advantage of the credit. The federal government will reduce the credit to 26 percent in 2020 and 22 percent in 2021. Homeowners who want to reap the maximum tax benefits need to act within the year to cash in. "Prices for solar energy systems have dropped considerably over the past few years," Saul said. "Some financing options are so generous that people can quickly see a return on their investment." There are also solid reasons why businesses should make an investment in solar energy now. In California, the state is aggressively working to transition to cleaner sources of energy. In March 2019, many businesses that were previously exempt from critical peak pricing (CPP) were automatically enrolled. That includes all businesses, from small and medium-sized to large pumping and agricultural operations. Businesses with service accounts under 200 kW, and agricultural and pumping customers with accounts over 200 kW are now affected. CPP was already the default plan for many large businesses. It offers a discount on the usual summer electricity rate in return for higher prices during a dozen CPP events each year between 4 and 9 p.m. The events are likely to occur on the hottest summer days. Another reason to find the right solar contractor in California is the state's largest utility company filed for bankruptcy. That will mean substantially increased rates for consumers. Pacific Gas & Electric, which serves more than 16 million Californians, filed for Chapter 11 bankruptcy protection in January. The filing came after the company was confronted with tens of billions of dollars in liability after the state's devastating wildfires. It was revealed that PG&E’s equipment may have been responsible for causing many of the fires, which destroyed thousands of homes, killed dozens of people and caused billions of dollars in damage. The California Department of Forestry and Fire Protection Equipment reported that PG&E owned and maintained the equipment that sparked at least 17 major wildfires in 2017. The company was held liable for some of the damage. PG&E was not found to be responsible for a giant blaze which killed 22 people. However, the company's role in the 2018 fire is still under investigation by state officials. "The writing is on the wall and it's never been clearer," Saul said. "To take advantage of the savings and combat the larger electric bills, now is the time to go solar." 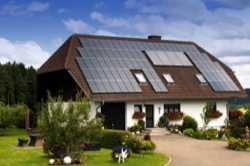 Solar Earth Choice is one of California’s pioneering renewable energy suppliers and offers the very best in solar panel installation. That includes both residential and commercial solar installation.